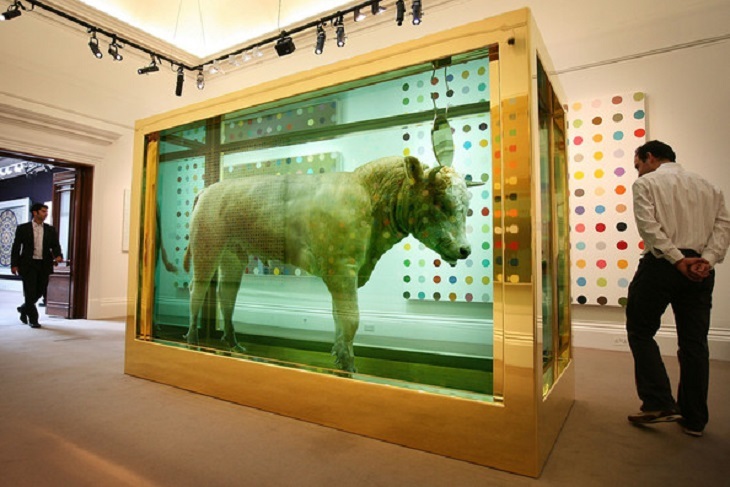 Readers of this column will have noticed that I am the only person in the world who actually likes Damien Hirst despite not making any money from him. 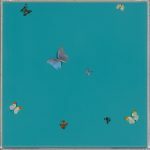 Since I first saw one of his butterfly paintings, I was captivated by the physical impossibility of resisting his charms. Over the years, I’ve ranted and raved about Damien at every possible opportunity; sometimes my words have fallen on deaf ears, but often I have been able to convert the faithless. I’m not interested in trying to make you love Damien, but I am interested in setting out the rational case for why he makes art that is worth looking at and thinking about. In order to justify the enormity of his studio and its mass production, Damien is compelled to say his work his conceptual. The fact that his work can be produced by anyone other than himself is explained by the fact that Damien is the ideas man, the architect of the work. 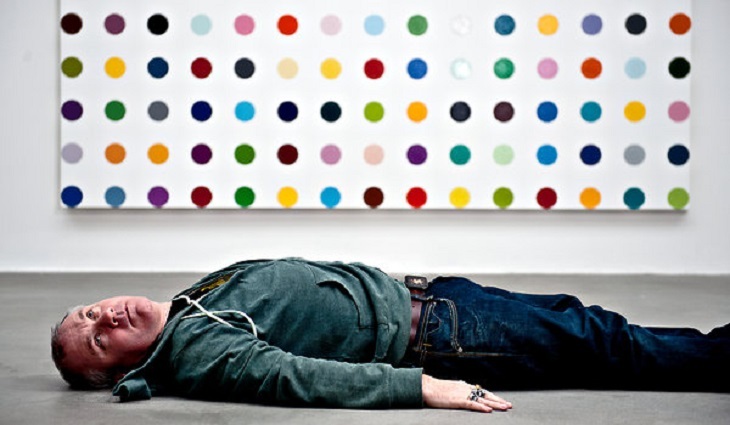 The appeal to conceptual art is, however, a mere conceit: it pays lip service to a general public who have not the faintest idea of what art is and who believe in a myth of original fullness by which the hand of the artist is the bastion of authenticity; and it conceals the much more interesting fact that Damien’s work is almost entirely concerned with aesthetics. This has to be veiled by conceptualism because aesthetics is thought be shallow, surface stuff. In reality, as the enlightened know, aesthetics is the richest way the human soul can interact with the world: as Nietzsche said, ‘it is only as an aesthetic phenomenon that existence and the world are eternally justified’. 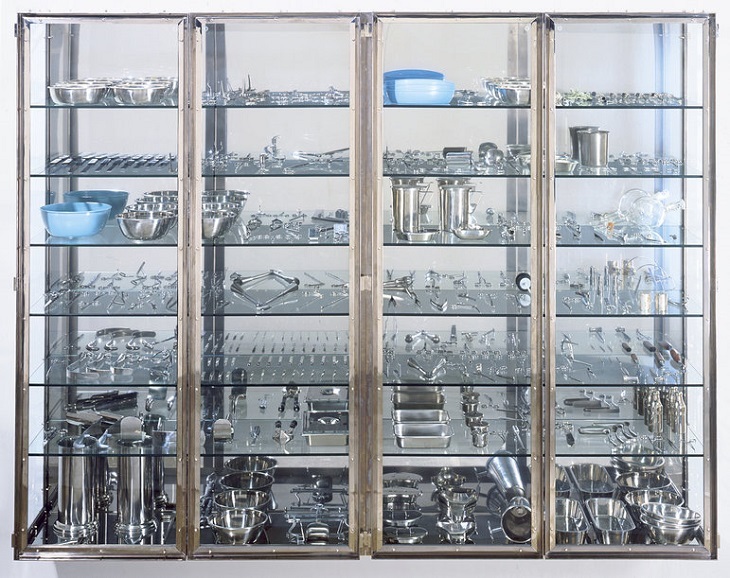 The work that best illustrates what is going on at the core of Damien’s practice is Still (1994), a stainless steel and glass display cabinet filled with glistening surgical instruments. Here is the aesthetic of minimalism effortlessly carrying the weight of a conceptual project which tethers timeless existential themes to contemporary excesses. The enchantment of Still lies in the duality of the fact that the clean, orderly appearance of the instruments opposes the brutal, bloody reality of invasive surgery. The conjunction of minimalism and conceptualism imbues the work with a religious quality, as if everyday objects, once arranged in a significant order and displayed on an antiseptic alter become holy relics infused with the sacrament of a divine power. Damien is all about the timeless themes of life, death, faith and beauty, but this is all dressed up in the quintessential aesthetic of its time. 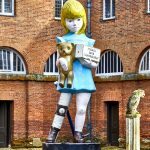 The way Still looks is 1994 – post-minimalism, post-Jeff Koons’ hoovers, post-Modernism, post-Pop, departing from them all but still retaining traces of their influence – and could not have been made at any other time in art history. But its subject is timeless, expressing the vexations of spirit that simply come with being alive and being human. This melding of the timeless and the contemporary illustrates the way in which there is always a duality at work. Following in the footsteps of Blake’s innocence and experience or Nietzsche’s Apollo and Dionysus, Damien’s work hinges on oppositions which conflict with and complement one another. The work is striking precisely because it flagrantly contradicts itself, forcing the viewer to enter into battle with it and with themselves. The Spot Paintings are maddeningly simple in form but incomprehensible in their infinity; the Natural History works possess the quiet charm of science at the same time as expressing the brutality of death; the Butterfly Paintings are humorous accidents and senseless murders of beauty; and the diamond skull is an act of grotesque ostentation at the same time as a heroic victory over death. The richness of Damien’s art is precisely this tussle between two parts of a duality which he sets up and leaves the viewer to fight out. 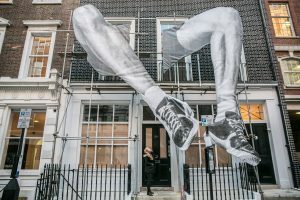 This conflict is most often played out in the relationship between the aesthetic of the artwork and its conceptual content, where the way it looks and what it is about are opposed to one another. Damien’s great talent is to ensure that this site of conflict is never jarring, incongruous or clumsy; there is never more aesthetic affectation than is required to express the concept, and there is never more conceptual content than can be read in the aesthetic. In linguistic terms, what he means is transparent in what he says. The conceptual content of The Physical Impossibility of Death in the Mind of Someone Living is about fear of death, conveyed in the shark which is big enough to eat you, seemingly swimming towards you in a vat of blue liquid; it makes you think about the fragility of life and the awful contingency of death; the shark instils fear, but its containment and inert lifelessness inspires reassurance, which is pretty much the fluctuating hysterical/complacent relationship we have with the prospect of our own deaths. All these ideas are contained in and manifest by the object before us – shark, glass, water – there is nothing outside of the object that we need to know in order to understand what the artwork is about. This economy of communication is Damien’s shtick. In the spirit of economy, Damien – like all great thinkers – only has one idea, which is refined, reiterated and developed throughout a body of work. This might stink of one trick pony but when you cast your eye over the history of human endeavour, you see that the people who make the most significant, efficacious contributions to thought are specialists whose contribution is deep and narrow, whereas a generalist will be forgotten for casting their net too wide and in too shallow waters. Damien’s one idea is that death is a certainty and a fact, but nonetheless we fear it and we concoct manifold ways – science, medicine, religion, money, art – to delay or deny it. That is everything Damien is about. It may not be to everyone’s taste and some may question the wisdom of the one idea specialist, but great misdeeds have been committed in the name of taste and in pursuit of vapid generalisation. The compelling thing about Damien is the ingenuity of the manner in which the idea is aesthetically manifest. All his work is iterations of the one idea, but those iterations are discretely different and delicately nuanced. An artistic practice that consists in the one idea reiterated, explored and extrapolated in different, evolving aesthetic forms is bound to entail repetition. 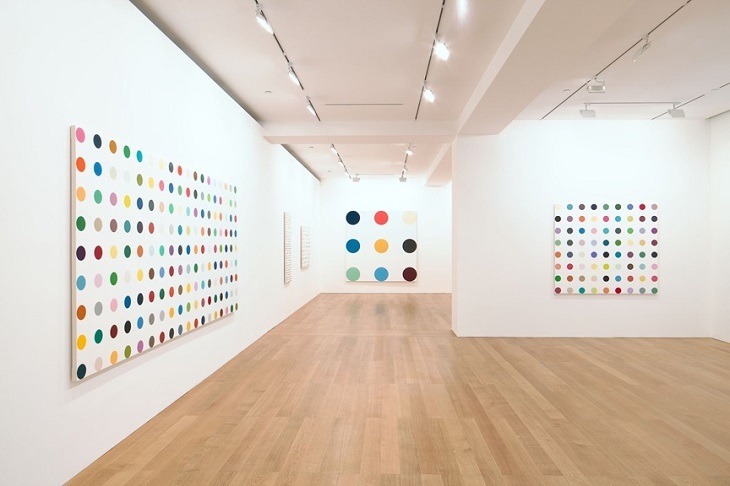 Damien trades in repetition with discrete variation: every Spot Painting repeats the format, but each one has different size spots, different colours and different dimensions; each Natural History work has a different animal, and even the ones that all contain sharks have different sizes and different breeds; the Medicine Cabinets contain different drugs; and the Kaleidoscope Paintings are different shapes and sizes with an array of different butterflies. The works in a series are superficially similar because they are born of the one stable concept, but, in the language of Nelson Goodman, they are finitely differentiated – the affect they produce differs each time according to the effect of the details. And for Damien, the devil is in the detail. This repetition and detail is itself a conceptual gesture in a body of work about death: death repeats itself eternally as long as there is life, unperturbed by the tedium of its repetition; and the only things that render bearable the tedium of the cycle of the human drama is the details of an individual life, which has fleeting moments of elation, tragedy, love and loathing. It is, therefore, part of the meaning of the work that there is something eerily familiar in this grid of spots or that dead animal – the sameness of repetition brings home your insignificance in the ghastly cycle of death as just one more speck of dust floating aimlessly into the furnace of the sun, and the difference in details reflects the unique beauty of all things that are born to strive without purpose and to die without reason. That’s pretty rich for a guy with one idea. If there is just one idea endlessly reiterated in slightly different aesthetic forms, Damien must have another trick up his sleeve which explains why his work is so expensive. The trick is that he pretends to be a conceptual artist. The fact that the one idea is so intellectually thin and time-worn bars Damien from being a conceptual artist: he is not about concepts, but about a concept which itself is not tremendously earth-shattering, for there is hardly anything more mundane than death. But this fact entails that he has to put all his energy in to the aesthetic, which evolves, refines and develops where the concept remains the same. The thing people respond to in Damien, after all, is always the aesthetic, which is variously achieved with bling, craftsmanship, the sublime or shock and awe. Nobody is ever amazed by the ideas, theories or sentiments, but most people, even the most sceptical, cannot helped but be wowed on occasion by the aesthetic. There is something about the sight of a highly polished stainless steel cabinet filled with 12,000 hand-crafted pills that only the most sensually impoverished person can resist or deny. Sure, the aesthetic may sometimes have the feel of a lousy trick or a cheap thrill, but the fact that we are nonetheless seduced says more about our base desires than it does about Damien’s art. Once we see Damien and an aesthetician who is in the business producing a feast for the senses over the mind it becomes clear why he is so successful. The commercial artworld loathes nothing more than ideas, thinking, intellectuals and rational debate; it despises these things because they can sway – by a well-worded speech and an immaculately argued text – a client away from buying art, whereas the way something looks, its pure aesthetic unadulterated by rich critical prose can seduce in an instant. Big ideas get in the way of big money. Damien, however, has nothing to worry about because he has no big ideas; he has only one idea and many aesthetic manifestations of it. If forced to choose, the market will choose aesthetics every time, so Damien does very well out of a world which likes the way things look but prefers them not to think. Do I, as a philosopher, have a problem with this? No, I do not because aesthetics is a meaning, a purpose and an end in itself. As Nietzsche said, ‘it is only as an aesthetic phenomenon that existence and the world are eternally justified’. Aesthetics is the science of sensation, the feeling of what happens, without which we are mere robots blindly going through the motions of life. If you stare deep into the eyes of the sheep in Away from the Flock, its cold, watery eyes stare back at you with such grim pleading that a wave of sadness washes over you and you forget about Damien and the 90s and all the money, and realise in one crystalline moment of pure sensation that art is the standing possibility of enlightenment through aesthetics. In the final analysis, Damien is in the business of sensations – the yuck of severed cow’s head covered in flies or the wow of a diamond encrusted skull – which is what life is all about. It is those discrete, precious moments when we feel the ground beneath our feet, linger on the touch of a lover’s hand and savour the view of the setting sun that define our lives and ultimately have the final word on whether we think they’re worth living. 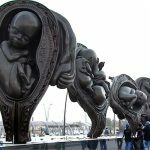 Damien challenges us to recognise that aesthetic engagement is all we can reasonably ask of the cruel world that, from the very moment we are born, has set itself on course to obliterate us. This is the last edition of Value and Ideas. Daniel hopes you have enjoyed it even half as much as he has and thanks FAD for being wonderful enough to give so much freedom and support. Daniel thought it only right to end as he began – in love with Damien. Thanks for reading. 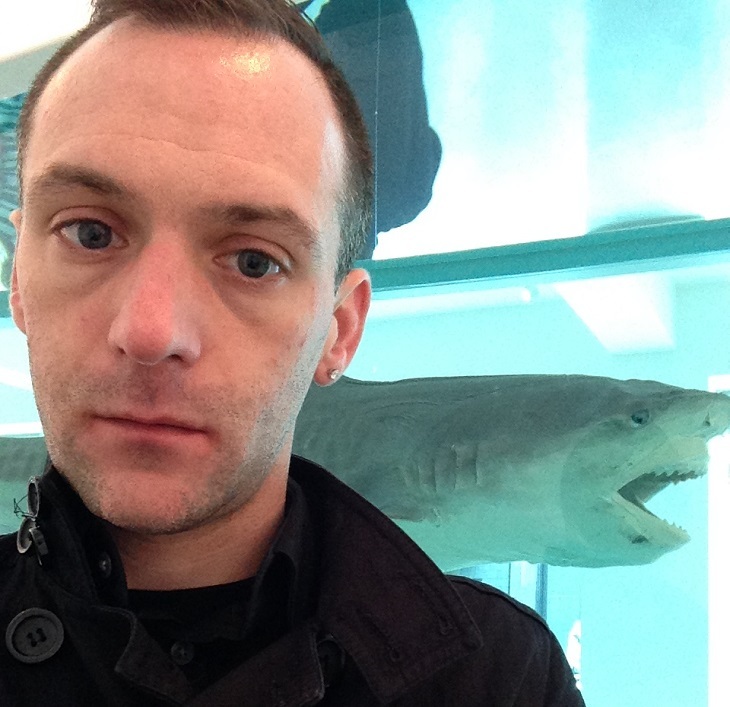 This entry was posted in NEWS and tagged Damien Hirst, Daniel Barnes, Value and Ideas. Bookmark the permalink. ← Jeff Koons: master of parody or great American con man?